Hair Loss is generally established if one looses more than 100 hairs a day. Also, hair loss is classified as hair loss since less than 6 months or more than 6 months. It is first important to understand the causes of hair loss before proceeding with treatment. Crash dieting, Chemical hair procedures such as coloring, rebonding, perming, post pregnancy, stress, accidents or surgeries or illnesses like typhoid/malaria are some of the common causes for acute hair loss (<6 months).This loss is related to the stress of the illness or surgery and is temporary and recovers within 6 months. Patterned hair loss(raised Testosterone in women and raised Dihydrotestosterone in men), Hormonal conditions (thyroid problems, PCOS), nutritional deficiencies ( iron, Vit B12 deficiency, Vit D, calcium), other chronic illnesses (kidney problem, liver problem), some medicines ( blood pressure or epilepsy medicines are responsible for chronic hair loss lasting more than 6 months. In patients having hair loss of long duration, often hair loss stops but the regrowth doesn’t start as the hair goes in covalecent stage (resting ). In such a situation injecting hair growth factors around hair follicle provides a conducive environment for the hair to grow back. When one consumes a tablet, only 10% of it reaches the root of the hair. But with mesotherapy, one can assure that 100% of the active ingredient reaches the root of the hair. In the right hands and the right product, hair mesotherapy and microneedling with dermaroller can give excellent results. 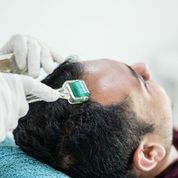 Hair mesotherapy involves using a cocktail of active ingredients - hair vitamins and micronutrients, amino acids, anti testosterone agents and peptides depending on the deficiencies observed by the treating doctor on history and laboratory results. Mesotherapy is administered by dermaroller or dermapen. It is generally repeated as weekly sessions and ordinarily 5 to 10 sessions may be required. Results are seen by 4th session.